A typical URI used for searches is /de/live/search/mykeyword?searchID=1234 or /en/archive/search/mykeyword2?searchID=4567. My website differentiates between live and archive searches. 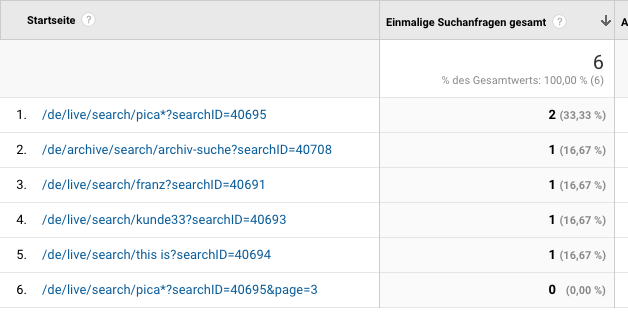 Is there a way to separate those two kinds of search in a way that I can analyze them separately in Google Analytics? Is there a way to remove parameters like "searchID" / "page" etc. from the url? How do I need to modify my Google Tag Manager tag? Is it possible to overwrite the url sent to Google Analytics as I do already for the page field? I would use separate views for each. One that includes pages that start /de/live/search and one for /de/archive/search. Then you could exclude the query parameters from your main reporting view in the view settings. Not the answer you're looking for? Browse other questions tagged google-analytics google-tag-manager query-string site-search google-site-search or ask your own question. How to enable Site search tracking in Google Analytics when query parameter is a fragment identifier?